With every new season, the saturation of anime series continues to expand. If your tastes are fairly broad, there is plenty to keep yourself occupied with from currently running shows and a backlog spanning several decades. For theatrical films, however, the market is significantly thinner. If you don't count films based off of an anime series — original plots or condensed story arcs — the choices are rather limited. The big names are Ghibli, Otomo, Oshii, Kon, and Shinkai. Tragically, Satoshi Kon has passed away which will leave a noticeable void in Japan's animated film output. Otomo's last works include the disappointing Steamboy and oddball live action Mushi-shi adaptation. Shinkai is hard at work on a film that seems to be a (welcome) departure from his usual fare. Miyazaki and Takahata aren't getting any younger, and man cannot live on Ghibli alone. Thankfully, 2006 saw the release of The Girl Who Leapt Through Time as the feature length debut of Mamoru Hosoda. 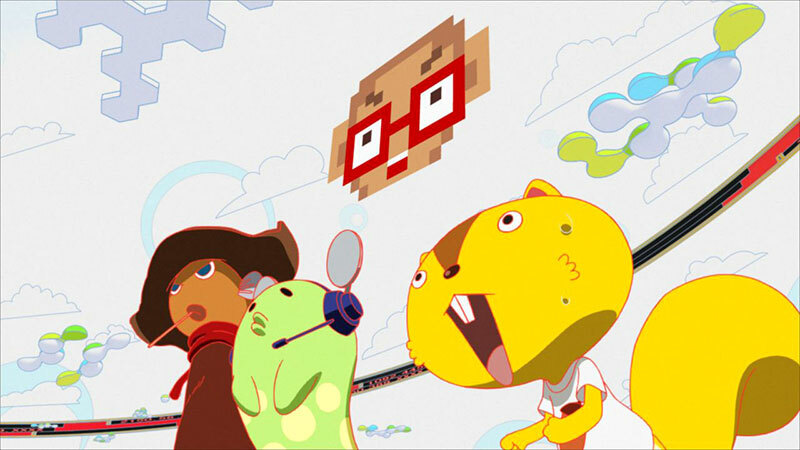 He went on to direct Summer Wars in 2009, establishing himself as a key industry director. Kenji Koiso, a high school student and mathematics enthusiast, is recruited by a girl at his school to help her out with some job. Despite his current part-time work with the infrastructure of virtual-reality super-network OZ, he decides to help her out without asking details. He helps carry her things as they travel to the traditional Japanese family mansion to celebrate her grandmother's 90th birthday. The girl, Natsuki Shinohara, asks Kenji to play along as she announces him as her fiance to her grandma. He now finds himself in the awkward position of being a pseudo-newcomer to this tight-nit and very large family descended from a warrior clan. During his first night there, he receives an email with a large string of characters that he is asked to decrypt by an unknown entity. Being almost Japan's representative for the Math Olympics, he wastes no time in pulling out some paper to work out the problem, which takes him all night. What he did not realize is that he was being asked to break the security that would breach the main OZ server, and in the morning he finds that his account is being used by the hacker to cause chaos in OZ. With most major government and official institutions being dependent on OZ, the hacker is able to cause damage not only online, but in physical space by taking over the person's privileges. For example, by obtaining the account of the president it would be possible to launch a nuclear missile. Kenji discovers that one of the family members, Kazuma Ikezawa, is the infamous OZ gaming champion King Kazma. The pair find themselves in a battle against a dangerous artificial intelligence being tested by the US Army within OZ. Meanwhile family drama arises as the problems online are connected to the family in ways they did not expect. 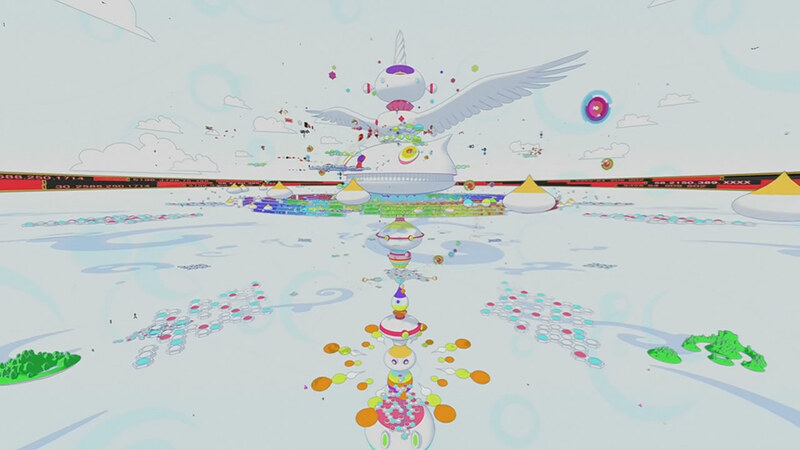 One of the most common complaints made toward Summer Wars is criticism of its technical inaccuracy. The story revolves around an incredibly advanced Internet structure, called OZ, that can be connected to through all types of devices and thus has became an extremely integral part of business, culture, and communication. Users create avatars and are able to interact over OZ in various ways: chatting, shopping, business, learning, etc. Additionally, languages are instantly translated to allow communication with anyone. Even the least technically minded viewer can see that it is an unrealistic view of the Internet. This leads to many lumping it together with WarGames and Hackers with their over the top, glamorized distortion of real technological advancements. However, this is completely missing the point of the story. Summer Wars may not be realistic in its details, but that is not the point. It is an exaggerated stylization of computer communications and should be treated as such. Like much good science fiction, it is able to make very relevant points that concern real world technology in a highly fictionalized setting. A major theme of Summer Wars is communication. OZ's primary function, like the internet, it to connect people and services from all over. The film demonstrated both the dangers of over-reliance on digital networking, as well as celebrating the positive aspects of everyone being able to work together towards a goal. The theme goes beyond modern technology; the grandma was able to use contacts from a lifetime to make phone calls and encourage family members and important decision makers to take action during the crisis. Throughout the movie, communication is key in solving problems — online and off. One aspect that many viewers should be able to relate to is the contrast between the characters taking initiative and using their computers to fight the AI, and the other relatives who can't understand why they are wasting their time with "video games" during this time. For Kazuma, Kenji, and the dads who pooled their resources together, nothing is as important as stopping that threat inside OZ. They realize, especially after what just took place in their own lives, that what goes on in the wires does affect what goes on the "real world." It isn't until tragedy is -literally- looming over their heads that the non-techie relatives finally realize the gravity of the situation. Hosoda touches on plenty of scenarios throughout the movie that could have been pulled straight from Slashdot. Compromised users were being assured that the security was impenetrable even after the hacking took place. Online accounts held enough power that stealing their account granted the hacker the user's government privileges. A dangerous artificial intelligence program was developed which questioned the responsibility of the developer who didn't actually implement it himself. A hacker was causing problems through an account that had been taken over, leading to the arrest of the innocent true owner of the avatar. While the movie itself may be an implausible action movie with pseudo-technological workings, the points it makes are often grounded in reality. The actual computer use is done in a way that can be approachable to the average person, but the technically inclined viewer should be able to appreciate its themes with a deeper understanding. Instead of seeing it as dumbed down or inaccurate, I adored the stylization of the Internet and artistic interpretation of technical concepts through Superflat imagery. The last thing I would have wanted is if it became an Nmap documentary. 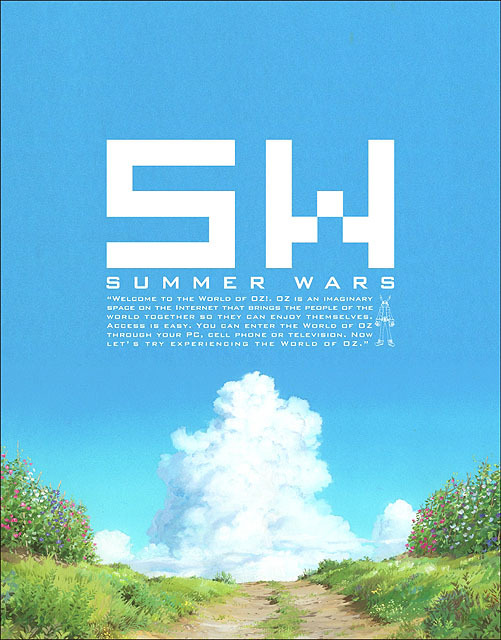 Summer Wars has very impressive production values with smooth, detailed animation and a high degree of artistic merit. Two distinct art styles are used to easily distinguish the real world and OZ: The real life characters are designed by Yoshiyuki Sadamoto, whose work contains the same appeal and quality that he is known for, and I've noticed since The Girl Who Leapt Through Time that his style has become even more distinct and refined. The background artwork is composed of beautiful countryside scenery and convincing realistic settings. The visuals are extremely detailed, which provides a noticeable contrast to the Superflat style used in OZ. 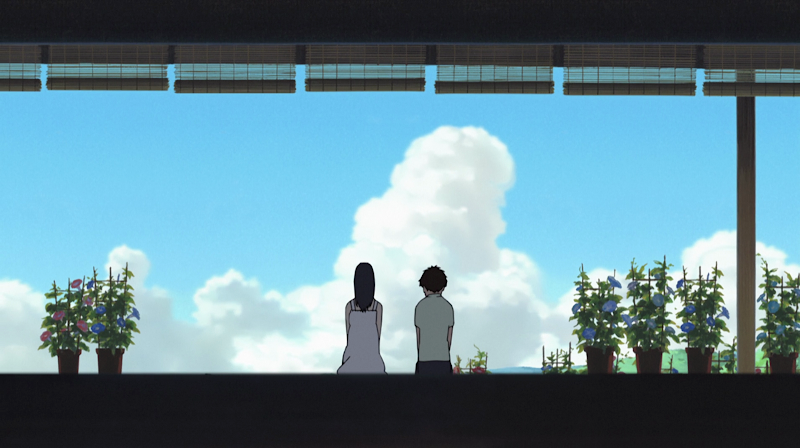 This style, mostly associated with the work of Haruki Murakami, is frequently used in Hosoda's work and has been become a trademark of his style. Even his work with Digimon incorporated a very similar (if less ambitious) Superflat world for the Digimon to fight in. 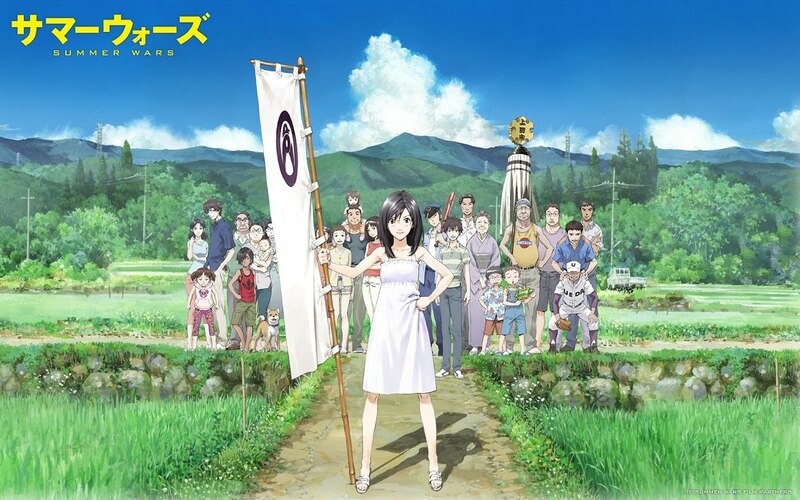 Summer Wars takes it to a new level, with a fantastic stylized world with bright, flat colours against a largely pure white canvas. 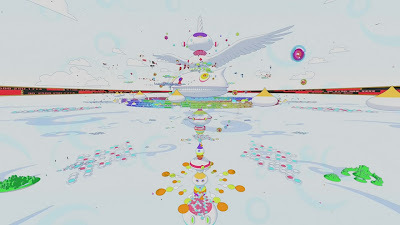 I've always been a big fan of the Superflat style, and Summer Wars delivered a truly spectacular example of the craft. Hosoda has obviously been holding onto this premise for a while — after all, his work with Digimon uses almost the same plot. In Digimon: Our War Game, a virus-type Digimon is infecting all of technology through the Internet and causing chaos by manipulating everything it can. Some of the first season's cast meet up to stop the threat by sitting at their computers and working with their Digimon partners who are battling inside a Superflat-style online world. The conclusion practically mirrors that of Summer Wars with the virus launching a nuclear missile (the possibility of this was even alluded to in Summer Wars, I'm assuming as a reference). In the end, people around the world send emails in support of the Digimon. There are so many emails that Izzy/Izumi forwards them to the virus who is then slowed down (DDoS?) enough for them to finish it off. It is good to see that Hosoda was eventually able to fully flesh out the concept with the experience he has gained since then. I absolutely love this film. It follows a fairly typical action blockbuster formula, but with a level of craftsmanship, intelligence, and social satire that elevates it above the expectations of the genre. 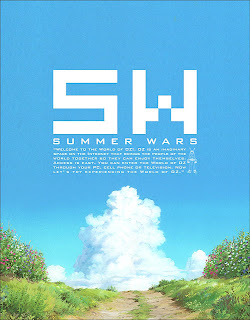 I have no doubt that there will be criticism of its typical action film influences, but it really does Summer Wars a disservice to lump it with the mindless action film crowd. If anything, it takes the elements that makes such films so entertaining, but loses the pedestrian brainlessness associated with them. Instead, it presents a thoughtful, realistic, and charming portrayal of family life in addition to the cyber-warfare action plot. Summer Wars is a film that embraces a video gaming, highly connected culture and equally the importance of everyday family life. It is a near-perfect representation of the joys of living in the information age, presented in a wildly unique and enjoyable package. This review is based on a retail Blu-ray disc purchased by the reviewer.